In just three months, a new CCC partnership with FCA has led to collision repairers being notified of 50,000 customer vehicles under critical Takata airbag recalls, the information provider announced Thursday. FCA began sharing Takata airbag recall data with CCC ONE in August 2017. Shops working on a recalled FCA vehicle receive a pop-up warning them about the threat to a customer. 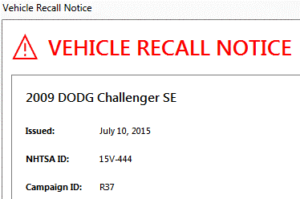 CCC provided a screenshot of one such alert for a 2009 Dodge Challenger SE. At least 12 deaths in the U.S. (and possibly a 13th) and 19 internationally have been tied to exploding Takata inflators, according to the National Highway Traffic Safety Administration. “If an open recall is detected, collision repairers are encouraged to inform the vehicle owner and supply a printed copy of the manufacturer’s recall notification,” CCC wrote in an news release. This is a great piece of customer service for shops to offer consumers, even if the actual recall work must be done at a dealership. Besides being the right thing to do, it makes the shop look knowledgeable and caring — which can’t be bad for customer satisfaction and word-of-mouth. Kinsherf said shops really like the feature, which leads to better interaction with customers, and it improves the customer experience as well. 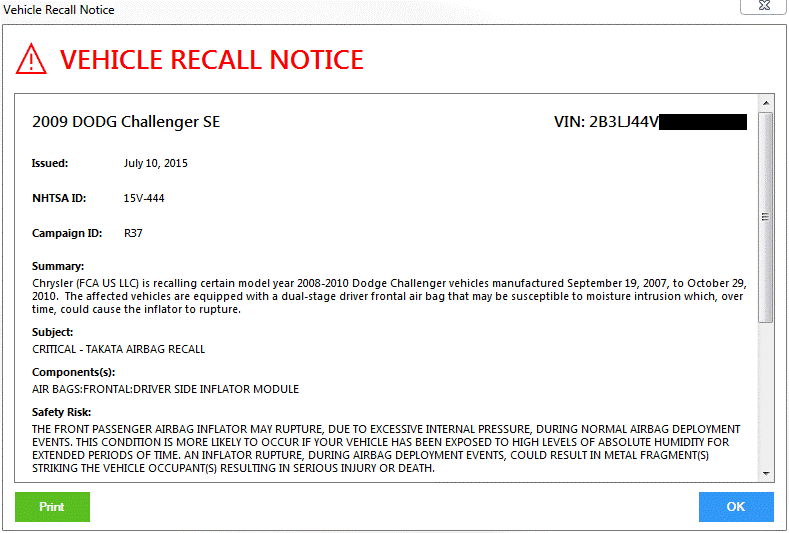 Recall messages are customizable by OEM, and FCA and other manufacturers could flag any number of parts besides the Takata inflators, according to Kinsherf. However, he described a sentiment of using the CCC alerts to emphasize critical safety concerns rather than swamping repairers and customers with every single recall. “You don’t want to have 50,000 alerts showing up,” Kinsherf said. Kinsherf said CCC’s OEM recalls partnerships started in October 2016 with Honda, and it also has worked with a third undisclosed OEM. CCC also has been in “pretty deep discussions with several others,” he said. It’s a good deal for an OEM. Kinsherf said the completion rate — a measure of how many customers notified actually had the recalled part replaced by a dealership — related to its alerts have been “an order of magnitude” better than when customers are notified by mail or social media campaigns. Kinsherf said CCC’s OEM recall partnerships started with messages to repairers for obvious reasons, but it expects to expand the service to insurers. Asked if CCC could leverage the recall VIN notification partnerships to obtain better support for VIN build data lookups, Kinsherf said the company had been talking to OEMs about the topic. CCC users don’t need to limit their efforts to FCA, Honda, and the other OEM’s vehicles. The information provider has for more than a decade offered both repairer and insurer CCC users the ability to generate recall alerts for any specific VIN by leveraging NHTSA’s recall database. Shops can also manually search the NHTSA recall database themselves on behalf of their customer, or just enter VINs into each manufacturer’s own specific recall site.